In this book prominent scholars from around the world debate two major themes: the past and future of the capitalist world-economy, and the ways in which a capitalist economy shapes Western research, the academy, and broader knowledge structures. Putting the two themes together, they also analyze the relationship between scholarship and the rest of the world. The book is published to commemorate the 25th anniversary of the Fernand Braudel Center. Contributors are Samir Amin, Christopher Chase-Dunn, Bart Tromp,. 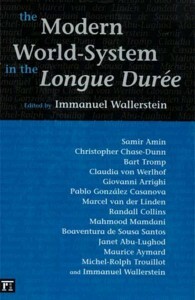 Claudia von Werlhof, Giovanni Arrighi, Pablo Gonzalez-Casanova, Marcel van der Linden, Randall Collins, Mahm ood Mamdani, Boaventura de Sousa Santos, Michel-Rolph Trouillot, Janet Abu-Lughod, Maurice Aymard, and Immanuel Wallerstein.